Which compound Hankook TD did you test? please try the test again when the tires are heat cycled. we've been running hoosiers and we know they are done because when i go to take tire temps the probe won't go in them! its a bit odd because its a little before the driver says anything. Last edited by diyman25; 10-16-17 at 01:14 AM. Last edited by diyman25; 10-16-17 at 01:13 AM. 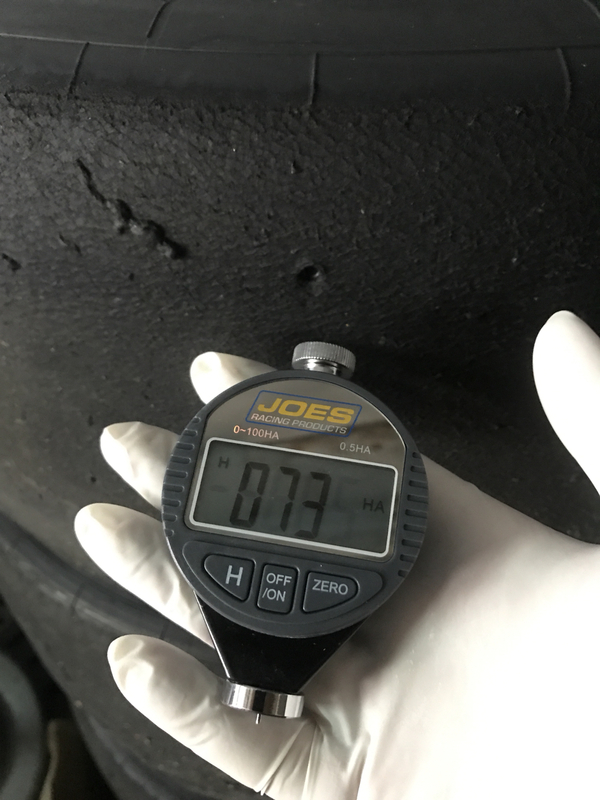 Remember that a tire with a shallow layer of tread compound will always read harder than one that is thicker because there is less rubber to deflect. 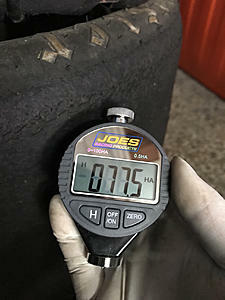 So worn tires will always read harder than the same tires new, even if the compound is the same actual hardness. Also, tires from different manufacturers or with different compounds are not the same when trying to evaluate which will have more grip. 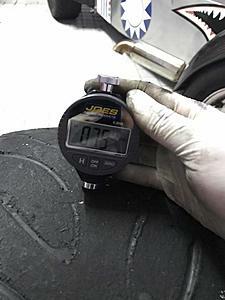 Sometimes a harder tire will actually give more grip depending on the track surface roughness or the tread chemistry. So, even though a durometer reading is useful, don't read more into it than you have experience with. 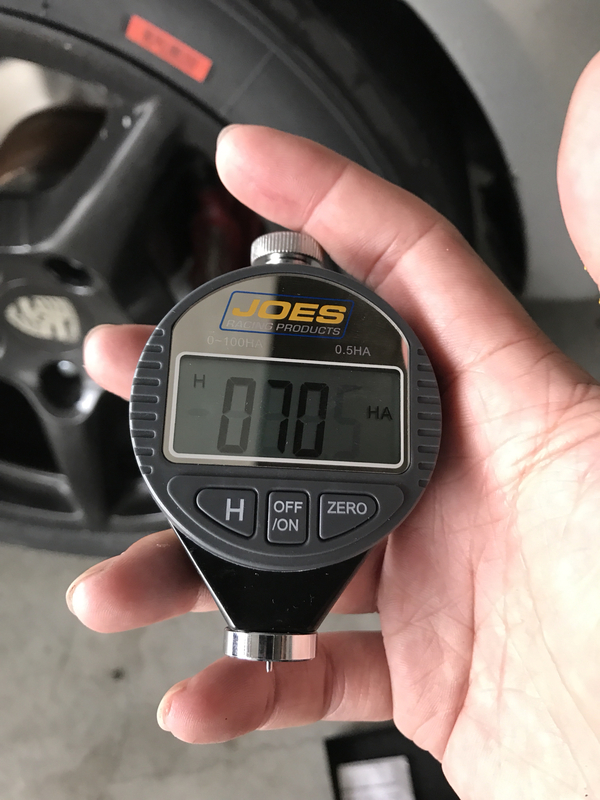 I have always used the thumb nail test on tires. Its now an unconscious habit with me and every race car I approach gets the thumb nail test on its tires. I have observed this behavior in lots of other racers too. To parrot DaveW, durometer and thumb nail feel doesn't prove much. 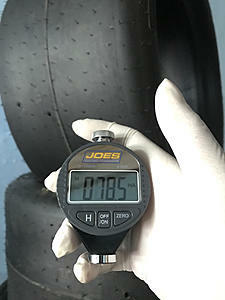 When I was a poor racer scrounging tires, I ended up with a set of used McCreary formula car tires for my Mustang. They were soft as all get out - A++++ on the thumb nail scale. In practice, mounted on my car for an autocross, they had absolutely no grip. 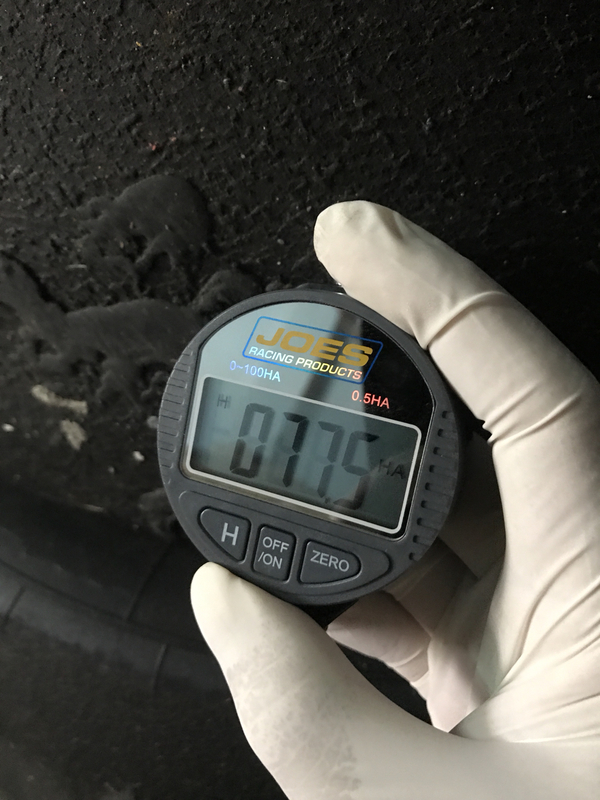 Knowing the real world performance of a tire and how that tire changes with heat cycles is the only way to predict a tire's behavior in my experience. What? No. Used tires always read harder because they are harder. 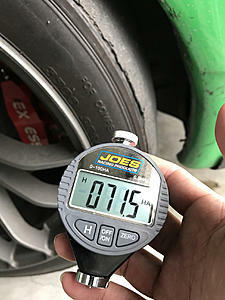 A signficant percentage of tire wear (50-90%) happens because of evaporation. The rubber gets harder with age. 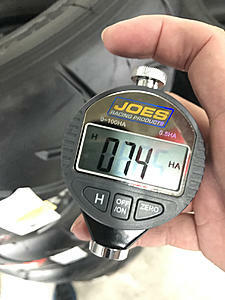 This is why passenger car tires seem to wear halfway very rapidly and then they stay half worn for another 40,000mi. 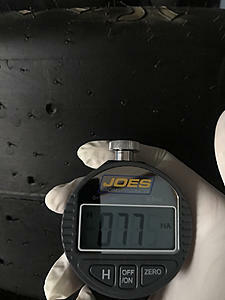 Much of the early "wear" is actually rubber shrinkage, and the compound gets harder over time. This is also why you shave new tires to competition depth instead of just using old ones. Hell, it's why serious autocrossers will discard tires after a handful of runs because they are "aged out" even if they have a lot of rubber left. did you test the Michelin slicks ? 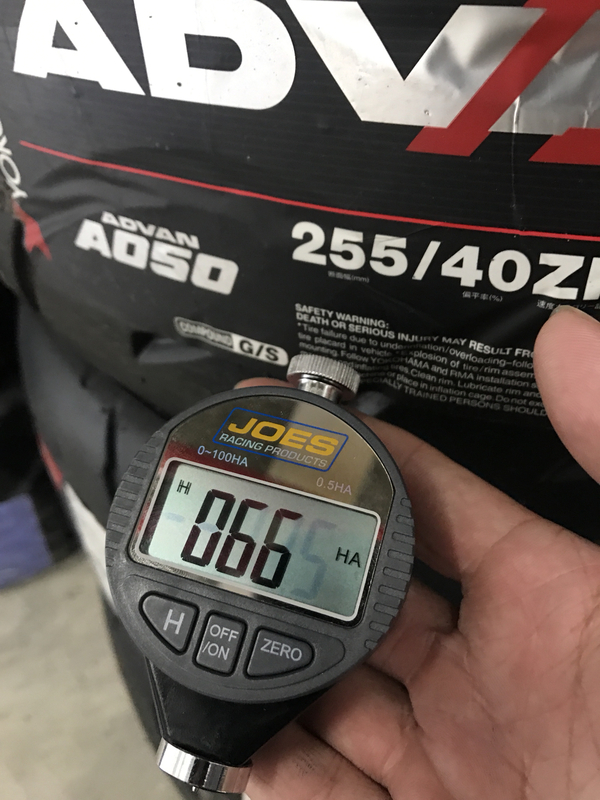 You are correct about tires getting harder with age and use. Of course they do. I never said that they don't. Clarifying what I meant to emphasize is that the durometer relies on deflection of its pin to measure hardness, so if the tread layer is thinner, say 1/16" thick instead of 3/16", you WILL get a higher durometer reading just because of less tread thickness to deflect. So you have to be careful that you're not seeing that effect when you measure. 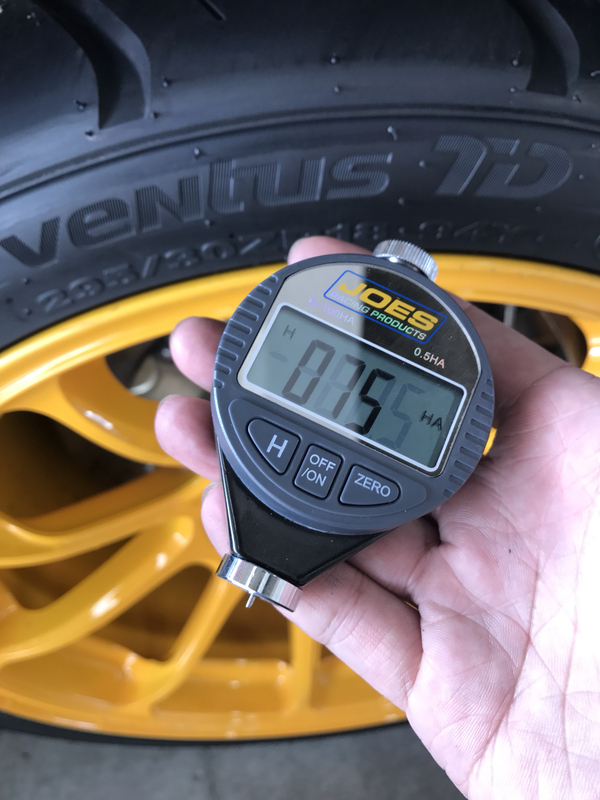 On the other hand, it may be an academic difference, because a thinner tread will not heat up as fast (or may not get to the proper temperature at all), so that, too, will affect grip. 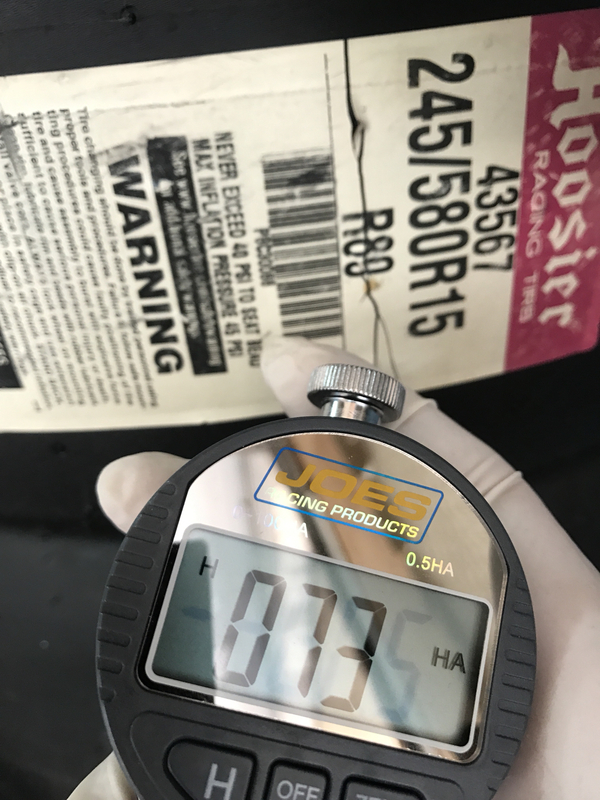 As a side comment, in the rubber industry, durometer readings are always taken on a sample at least 1/4" thick so that sample thickness effects are minimized. 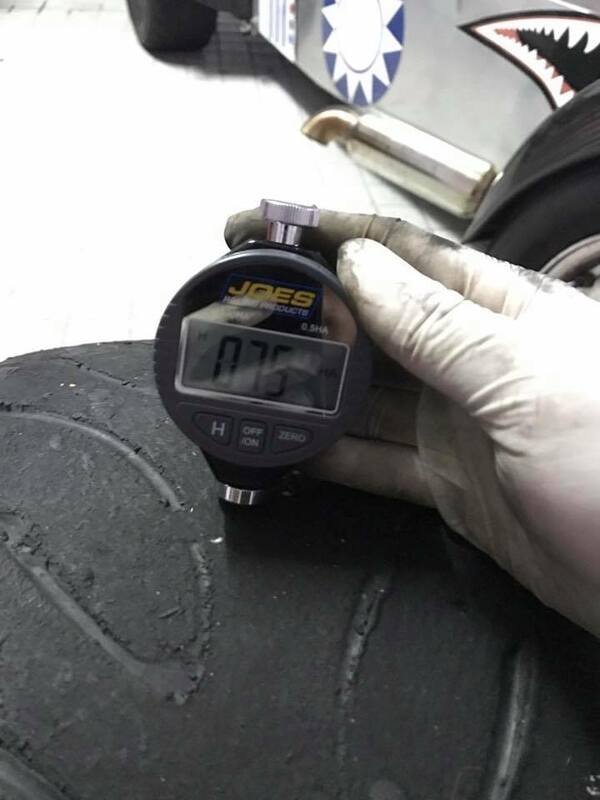 for example this A050 GS tires that i took off from my race car the center measure is less thread u can see in the pic is below wear bar , and what i measure is 15 harder on the shoulder. !!! So which one is the favorite slick? Is Hoosier A7 really faster than the non-dot slicks? I was abit surprised a dot-r is faster than real slicks, just wanted to confirm from users with experience. In autocross real Avon non-DOT formula car slicks in an auto-x/sprint/qualifying compound are faster than Hoosier A7. If you are comparing some non-DOT Continental endurance slick to Hoosier A7 the A7 will be faster in an auto-x/sprint/qualifying situation. Tire grip to how fast they grease up. How light they are to how durable they are (catastrophic failure). With the variables of size and rules in the equation as well. It has been said in back to back comparison with CP autocross cars going between non-DOT and A7s that the non-DOT bias ply slick advantage over A7s has shrunk to only tenths to .5 sec on a 60 second course!